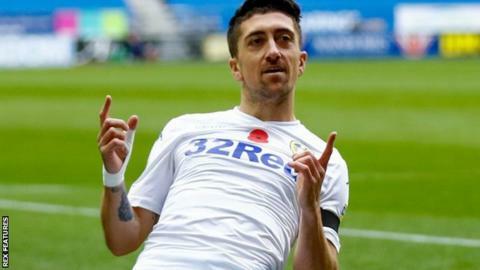 Kemar Roofe and Pablo Hernandez scored the goals as Leeds United eased past 10-man Bristol City. But Robins head coach Lee Johnson insisted the Yorkshire side were "lucky" - and that the game swung on visiting midfielder Josh Brownhill's red card for two bookable offences on 55 minutes, when the score was still 0-0. "The referee took the easy decision in front of a big crowd. The referee wants to run the show these days. "There were decisions that we didn't get but I don't care about the refs because they do it to us every week. We have had some poor refs the last few weeks." Leeds manager Marcelo Bielsa said: "It's a point of view that we have to respect. But we virtually didn't concede any chances for our opponent. "As far as I know I don't remember anything of note that they created. It was a very comfortable debut for our goalkeeper. "When I see the game again I will take this into account this point of view that we didn't deserve the result. "That we played with one player more made it easy for us. But that wasn't the only reason we won. We created plenty of chances." The game was evenly balanced before Brownhill, booked on 20 minutes for a foul on Ezgjan Aliosk, was sent off for a poor challenge on Roofe. The hosts, beaten 4-1 by West Bromwich Albion in their final outing before the international break, added some late gloss to the scoreline when Samu Saiz played Hernandez in with a well-weighted pass and the Spaniard finished neatly. Leeds, without their two senior keepers Jamal Blackman and Bailey Peacock-Farrell, handed a debut to youngster Will Huffer, as well as Finnish defender Aapo Halme. But they ended up cruising to a ninth league win of the campaign, which took them up to second for a couple of hours before Middlesbrough beat Brentford in the later kick-off, and ultimately the margin could have been greater but for some wasteful finishing from Jack Harrison and Ezgjan Alioski. Bielsa's side now face struggling Reading on Tuesday, while Bristol City will hope to end their losing run the following night when they travel to bottom-of-the-table Ipswich. Match ends, Leeds United 2, Bristol City 0. Second Half ends, Leeds United 2, Bristol City 0. Attempt saved. Lewis Baker (Leeds United) right footed shot from outside the box is saved in the centre of the goal. Assisted by Adam Forshaw. Goal! Leeds United 2, Bristol City 0. Pablo Hernández (Leeds United) header from the centre of the box to the top right corner. Assisted by Samuel Sáiz. Corner, Bristol City. Conceded by Barry Douglas. Substitution, Leeds United. Lewis Baker replaces Mateusz Klich. Attempt missed. Kemar Roofe (Leeds United) header from the centre of the box misses to the left. Assisted by Samuel Sáiz. Substitution, Bristol City. Mohamed Eisa replaces Jamie Paterson. Jamie Paterson (Bristol City) wins a free kick on the right wing. Corner, Bristol City. Conceded by Stuart Dallas. Goal! Leeds United 1, Bristol City 0. Kemar Roofe (Leeds United) right footed shot from very close range to the centre of the goal. Assisted by Pablo Hernández following a corner. Attempt blocked. Pablo Hernández (Leeds United) right footed shot from the centre of the box is blocked. Assisted by Mateusz Klich. Corner, Leeds United. Conceded by Jamie Paterson. Corner, Leeds United. Conceded by Andreas Weimann. Corner, Leeds United. Conceded by Niki Mäenpää. Attempt saved. Barry Douglas (Leeds United) left footed shot from outside the box is saved in the top right corner. Attempt missed. Samuel Sáiz (Leeds United) right footed shot from outside the box misses to the left following a corner. Corner, Leeds United. Conceded by Jack Hunt. Attempt blocked. Jack Harrison (Leeds United) left footed shot from the centre of the box is blocked. Assisted by Mateusz Klich. Foul by Liam Walsh (Bristol City). Substitution, Leeds United. Samuel Sáiz replaces Aapo Halme. Substitution, Bristol City. Liam Walsh replaces Hakeeb Adelakun. Substitution, Bristol City. Famara Diedhiou replaces Niclas Eliasson. Substitution, Leeds United. Jack Harrison replaces Ezgjan Alioski. Corner, Leeds United. Conceded by Niclas Eliasson. Attempt saved. Mateusz Klich (Leeds United) right footed shot from outside the box is saved in the centre of the goal. Assisted by Kalvin Phillips. Corner, Leeds United. Conceded by Adam Webster. Attempt missed. Kemar Roofe (Leeds United) right footed shot from the right side of the box misses to the left. Assisted by Pablo Hernández.